This homeowner was looking to run only the essentials during a power outage in order to protect his home and to keep him from camping. 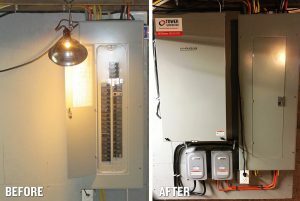 The size of his home and the electrical allowed us to power manage the range and the dryer in order to get him power to his entire home. The system was designed around an economical 12kw generator that allowed us to give him more circuits for less money. Customers are always pleasantly surprised when we are able to exceed their emergency power system and yet to stay within budget.